Until recently, Syria was a safe-haven for Christians. As secular leaders from the secretive Alawite sect, the Assad dynasty largely preserved Christian life, protecting Syria’s minorities from what was perceived as a collective threat from the country’s Sunni majority. Watching their once-shielding dictators fall like dominos across the region, Christians have suddenly found themselves on the wrong side of history. Faced by a rising tide of radical Sunni Islam, Christians in Iraq and Egypt have fled by the thousands. In Syria, concern over Christian repression has fallen on deaf ears, drowned out by popular support for the country’s opposition in the face of the Assad regime’s brutal crackdown. But that’s all changed since Al Qaeda terrorists started targeting Christians in Syria more than a year ago. Jihadists who overran Syria’s ancient town of Maalula last week disparaged Christians as “Crusaders” and forced at least one person to convert to Islam at gunpoint, say residents who fled the town. 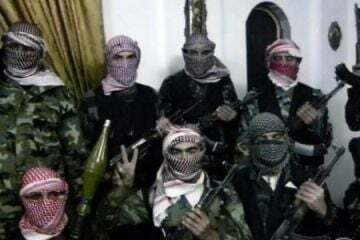 “They arrived in our town at dawn… and shouted ‘We are from the Al-Nusra Front and have come to make lives miserable for the Crusaders,” an Islamist term for Christians …. Maalula is one of the most renowned Christian towns in Syria, and many of its inhabitants speak Aramaic, the language of Jesus. “I saw people wearing Al-Nusra headbands who started shooting at crosses,” said Nasrallah, a Christian. Another resident, Rasha, recounted how the jihadists had seized her fiance Atef, who belonged to the town’s militia, and brutally murdered him. “I rang his mobile phone and one of them answered,” she said. The man told her Atef had been given the option of converting to Islam, but had refused. “Jesus didn’t come to save him,” he taunted. Another said one church had been torched, and gunmen stormed into two other churches and robbed them. Anas, their son, says he got threatening messages back in Syria: “Your money is for us to take, your wife is for us to sleep with, and your children are for killing. This is all halal,” or permissible under Islamic law. He escaped with his wife and children to Jordan, but not before his liquor store had been burned down. Most of the Syrian “rebels” are Al Qaeda. As NBC News reports, Al Qaeda is gaining more and more power among the rebels. Congressman Amish points out that the U.S. is breaking the law by aiding and abetting a designated terrorist group. Indeed, Obama’s own top lawyers warned him that arming the rebels would be illegal. Ironically, Obama has just renewed the Declaration of a State of Emergency for America first started by Bush in September 2001. That declaration of emergency is supposed to be about fighting – you know –Al Qaeda. But the U.S. has long wanted regime change in Syria … and long backed the most violent terrorists in the world for geopolitical reasons.